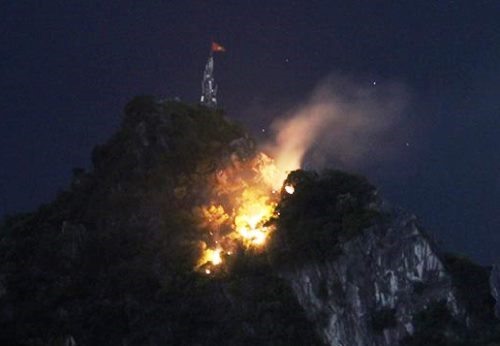 QUẢNG NINH — A fire broke out on top of Bài Thơ mountain in northern Quảng Ninh Province’s Hạ Long City yesterday. The blaze, which grew to tens of metres high, started at around 5pm and lasted for several hours. Hundreds of fire fighters and soldiers were mobilised to the scene. However, tough terrain made it difficult for them to extinguish the fire. The fire continued until 8pm yesterday. Local authorities evacuated households around the foot of the mountain for fear of landslides caused by the fire.